You'll be £4.99 closer to your next £10.00 credit when you purchase The Battlecruiser HMS Hood. What's this? The battlecruiser HMS Hood is one of the great warships of history. Unmatched for beauty and charisma, unequalled for size, for 20 years the she was the glory ship of the Royal Navy, flying the flag across the world in the twilight years of the British Empire. Here, in words, photos and colour artwork, is the story of her life, her work and her people, from the laying of her keel on the Clyde in 1916 to her awful destruction at the hands of the Bismarck in 1941. Among the eyecatching strengths of the book is a unique gallery of photographs, including stills from a recently discovered piece of colour footage of the ship, plus a spectacular set of computer-generated images of both the exterior and interior by the world's leading exponent of the art - a man who worked with the film director James Cameron (of Titanic fame). A wealth of new information on Hood's structure and operation make it essential reading for the enthusiast, modeller and historian alike. Hugely successful from its first publication, this is the forth printing of the ultimate book on the ultimate ship of the pre-war era, and is now presented in a new, smaller and affordable softback format. This book is a wealth of information. ... Mr Taylor’s lovely book takes us into the heart of the ship and shows so much of that life before the horrible death. His book really works for me because it illustrates the success of Hood in so many respects and the author nails her importance as a cypher of a lost Britain and all that she represents. Only recently one of her ship’s bells was recovered from the wreck miles down in the Atlantic Ocean. This feat does something to echo the immense effort to produce and operate a ship as amazing as HMS Hood and it is fitting that something tangible from her can be preserved. The most comprehensive study of a modern warship ever undertaken. Bruce Taylor was educated at the Universities of Manchester and Oxford where he received a doctorate in Modern History in 1996. Seaforth Publishing have published a number of his books to date, including The End of Glory, which combines a thrilling narrative and in-depth research of HMS Hood. 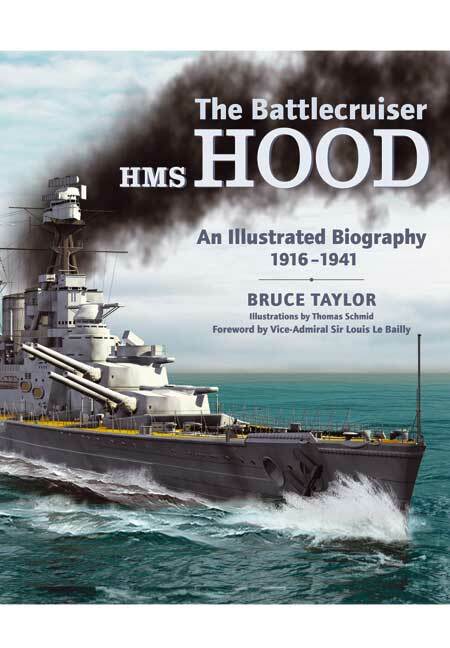 The Battlecruiser HMS Hood, was published in 2005 and is regarded as the ultimate reference work on the ship and a landmark in naval history. U-Boat Attack Logs, another major reference work, was published in 2011.